To hear about future events, please join our mailing list. 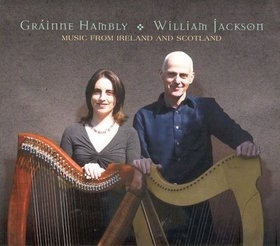 We were pleased to host a concert featuring Masters of the Celtic Harp: Gráinne Hambly & William Jackson. Gráinne comes from County Mayo in the west of Ireland, and is a music graduate of Queen's University Belfast. She began to play traditional Irish music on tin whistle at an early age, before turning to the concertina and later the harp. Over the past few years, Gráinne has toured extensively throughout Europe and the United States. She is also a qualified teacher of traditional Irish music and is in great demand at summer schools and festivals both in Ireland and abroad. Internationally known harper and composer William Jackson has been a major force in Scottish Music for many years. As a founding member of the band Ossian (1976-1989) he was part of the revival of traditional music in Scotland in the 70's and 80's, and became known as an innovative composer, using a mix of traditional and classical musicians in such acclaimed works as The Wellpark Suite (1985), A Scottish Island (1998) and Duan Albanach (2003). Touring extensively in Europe and North America he gained a reputation as a fine performer of traditional music featuring the Scottish harp, and also as a teacher. William is also a trained Music Therapist (Guildhall) and has worked in that area since 1993 in both Scotland and the USA. Apart from his Scottish background William has also been influenced by Irish music in his compositions, as both his paternal grandparents were from Co Donegal, Ireland, and he spent a great deal of his childhood there.